I always feel odd baking a cake without a special occasion to justify the effort. Cakes are just that kind of dessert! They are fancy. Fancy like the word fancy. I just wish the word “cake” sounded as elegant as the dessert it describes. The french word for cake, “gâteau” is a lot lovelier don’t you think? The French always had better style than the English I suppose. Birthday cakes, wedding cakes, Christmas cakes… there’s a perfect cake out there for every festivity on your calendar. Cakes/Gâteaux are just so celebratory and oh so perfect to share! Today marked the last day of my 2 week stint petsitting the chickens, lovebird and Max-the-cat at my parent’s home. As a little homecoming gift for my road weary parents, I decided to bake them a cake! Why not? A great way to enjoy a sit down together while getting the deets on their Patagonia exploration. What do you think? I think she’s a pretty good looking lady cake! 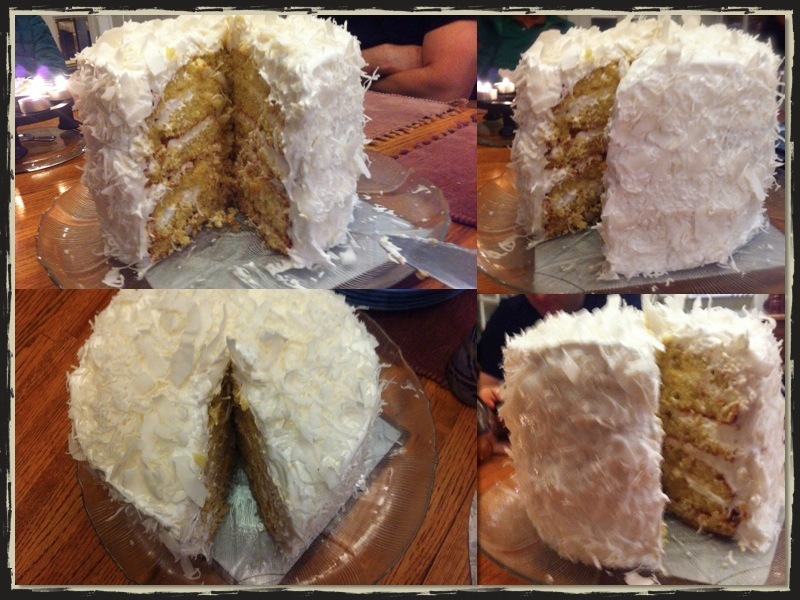 I had a lot of fun making this cake, especially the fluffy coconut meringue frosting that whipped up to be light as a cloud. Instead of using the requested fresh coconut (was too boggled this afternoon to think of where to find a fresh coconut in Vancouver in January) I went up to Kitsilano Natural Foods and picked up some grated coconut in bulk (nice and cheap!) I chose some large loopy coconut flakes and some “fancy flakes” to be the glamorous garnish on this little dessert. Yield: 10–12. Bake at 350 F 25 minutes. 3 cups grated coconut. The curly pretty kind. Buy in bulk. Note: This frosting isn’t supposed to keep too well, so it’s best to frost the cake the day it’s being served. However, to spread out the work, you can make the layers in advance.This is what I did! I made the cakes the night before and saran wrapped them once cool to keep them fresh for today. You could probably still enjoy the cake for days after making it (am planning on doing so!) . I bet it will stay delicious. I can just imagine enjoying a chilled sliver of the cake one day soon after work, perhaps with a mug of black coffee. The cake is baked to eat right away, but I wouldn’t toss the leftovers as it’s too darn delicious! Needs: Candy thermometer! You can buy this at any grocery store in the baking utilities isle. 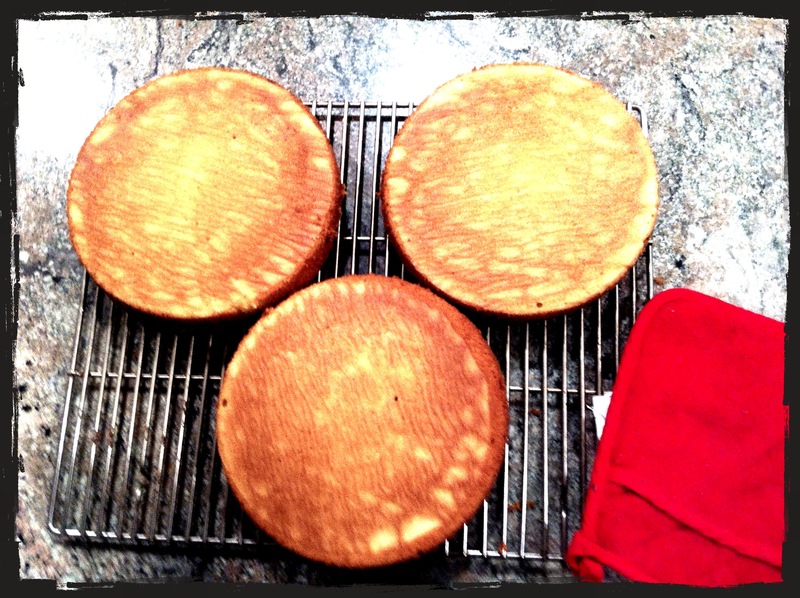 Preheat the oven to 350 degrees F. Grease two (or three if you have 3) 9″ cake pans. Line the tins with parchment paper rounds if you have parchment paper, and grease the parchment paper as well. If you don’t have parchment, just butter the pans well. In a stand up mixer or large bowl, cream together the butter and sugar until pale, light yellow, and fluffy, about 2-3 minutes. Add in the eggs one at a time, mixing well after each egg. Put aside. In a medium bowl, whisk together flour, baking soda, and salt. In a separate small bowl (or measuring cup), whisk together buttermilk, coconut milk, and vanilla. Alternate adding the dry ingredients and buttermilk mixture with the mixer on low speed before increasing the speed to high and beating for a few seconds to smooth out the batter. Pour the batter evenly into the two (or three) prepared cake pans, bang on the counter to remove air bubbles, and smooth the tops with a spatula. Bake until a toothpick comes out with just a few moist crumbs, about 30-35 minutes for two cakes or about 20-25 minutes if you’ve baked with 3 cake pans. Let the cakes cool in the pans for about 20 minutes before turning them out onto a rack to cool completely. If you didn’t use parchment paper, gently scrape around edges of cake pan with a knife and shake the tin with oven mitts to loosen the bottom. In the bowl of a stand mixer, use the whisk attachment to beat the egg whites and cream of tartar together until soft peaks form. Let this sit while you boil the sugar, syrup, salt, and water together in a saucepan over high heat. Stir to dissolve the sugar and cook until a candy thermometer reads 250 degrees F, about 5-10 minutes depending on the heat of your stovetop. *Note it is very important to get the syrup up to this temperature and to use a candy thermometer. I didn’t the first time, following instead the time reference and my frosting turned out as a wet, runny slop. Had to start again. Use a candy thermometer to guide your temperature! With the mixer on medium speed, drizzle in the hot syrup and add vanilla extract. 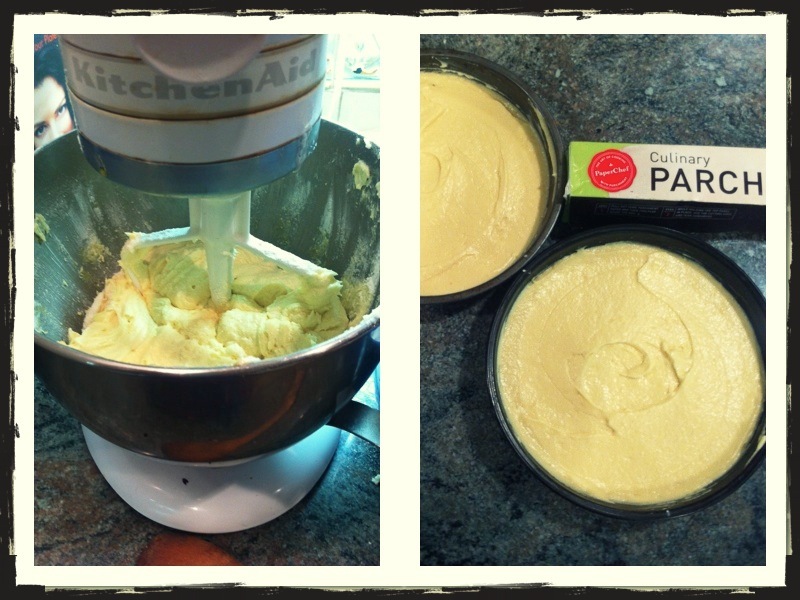 Turn the mixer to high speed and beat until the frosting has stiff peaks and is only slightly warm, about 3 minutes. 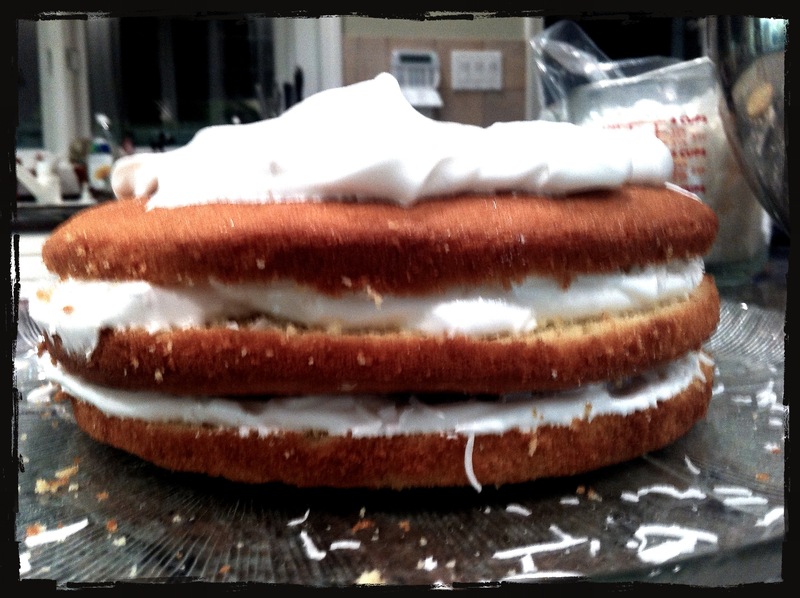 It should look and feel like a meringuey fluff cloud. Heaven in a bowl! 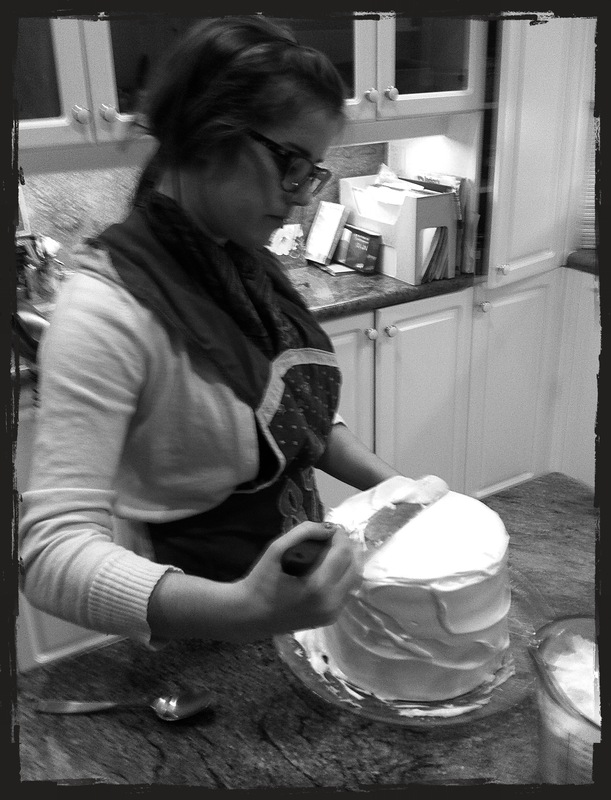 Place one cake layer onto a platter or cake decorating turntable. Drizzle 3 tablespoons of coconut milk over the cake layer and spread it around. Spoon about 1 1/4 cups of the frosting onto this layer and spread it thick, letting it spill a bit over the edges all around. Top with 1/2 cup of grated coconut. 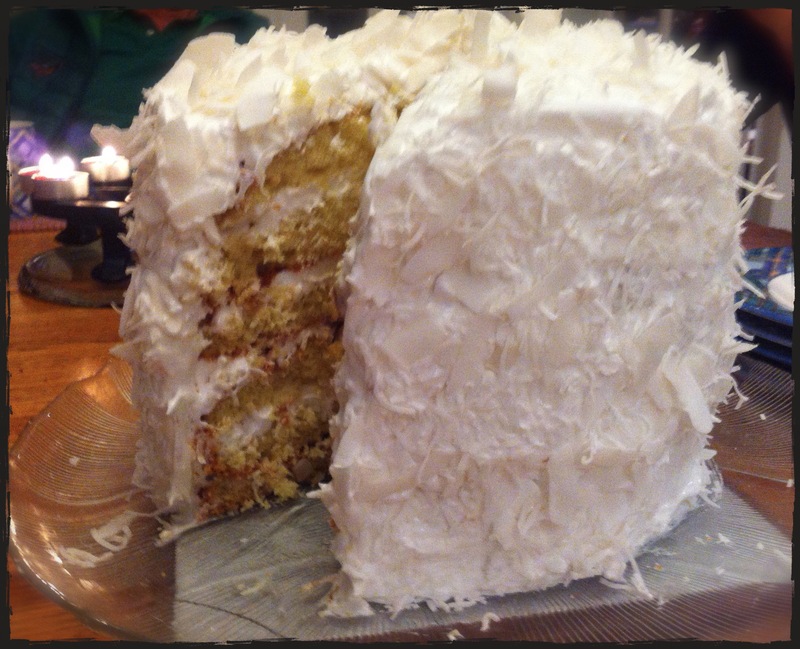 Continue layering cake layer, coconut milk drizzle, frosting, and coconut. On top of the cake, drizzle the last 3 tablespoons of coconut milk before covering the whole top and sides of cake with the remaining frosting. 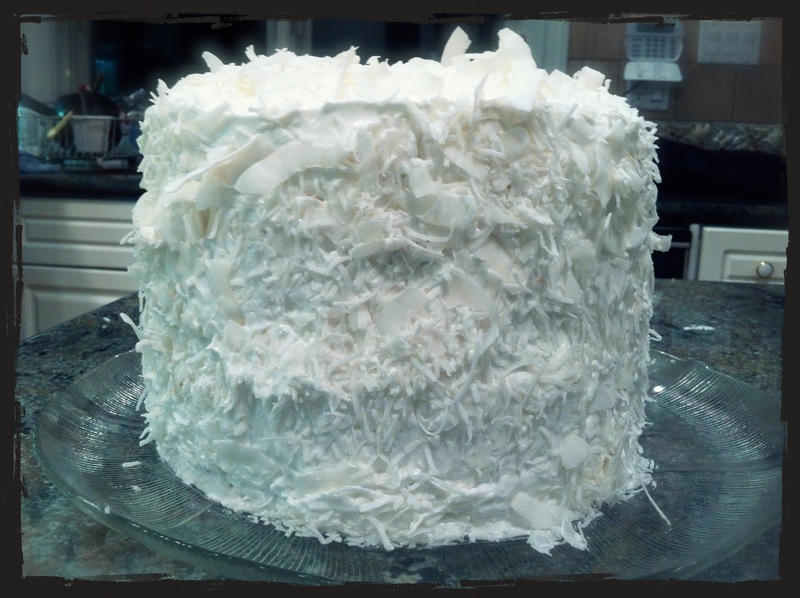 Spread it thick and billowy and use a cupped hand to lightly press grated coconut all over the surface of the cake — it’ll hide any frosting imperfections! Best served fresh. 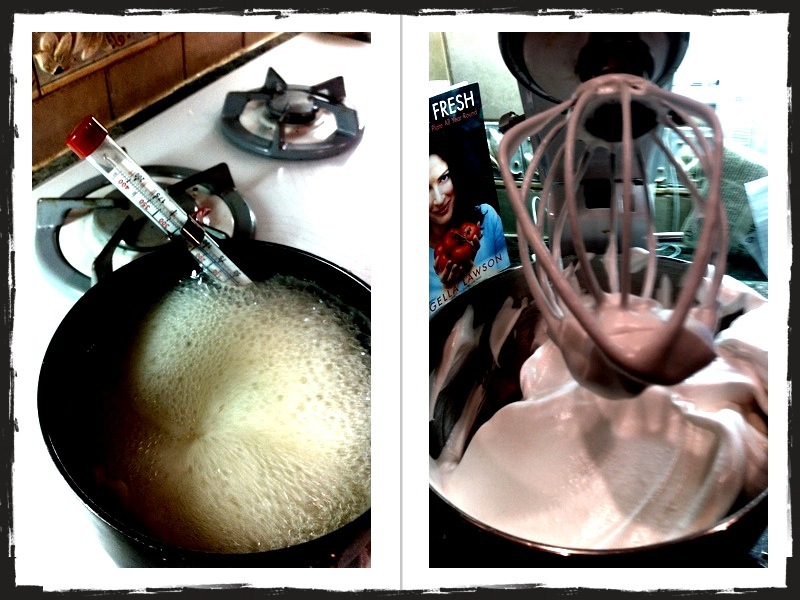 Making the meringue frosting and syrup with candy thermometer. Half way through the layers! Three to go. 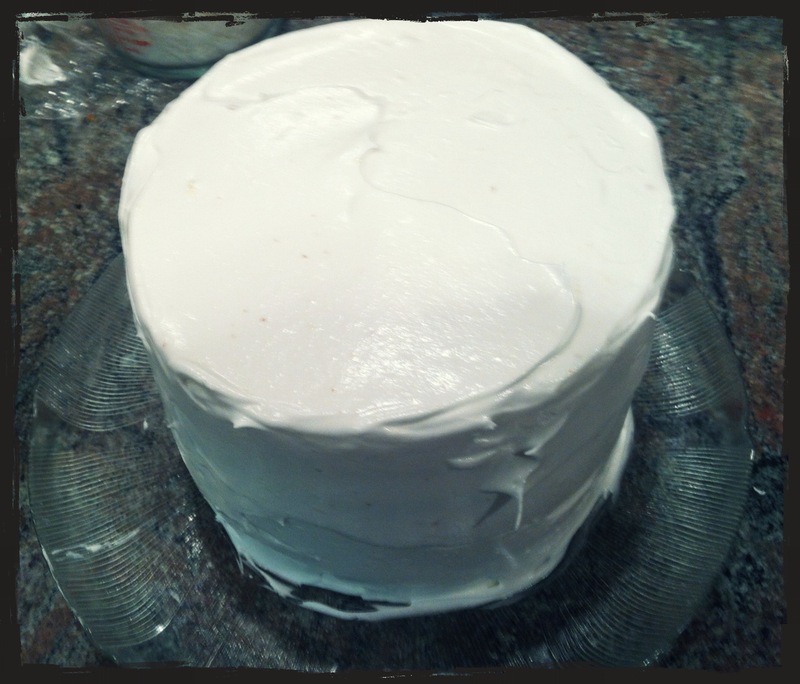 My first 6 layer cake! Don’t you love the pac-man angle? mmm all 6 layers in their creamy coconut excellence. So good it looks like it wants to eat you up for dessert. 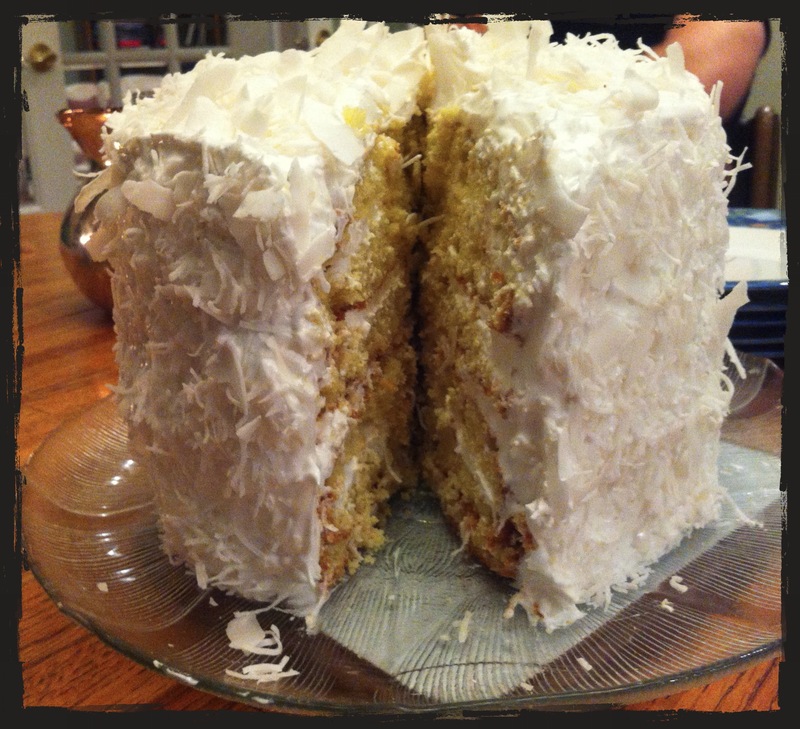 The Coconut Cloud Cake was a dreamy billowy success. We served it with some light berry tea after dinner and carefully dished it out in its precarious six story glory. The cake was decadent, impressive, creamy, fluffy and a comforting welcome-home-to-Canada dessert to share with my adventurous parents. This entry was posted in Baking, Cake, Coconut and tagged baking, cake, coconut. Bookmark the permalink. Maybe I shouldn’t have come to this blog site Heather. It is going to be dangerous. That Cocoanut Cloud cake looks divine. I wonder if I have any friends left that aren’t gluten free. Who can make it for! Next cake I make…I’m trying it.